Once seen as a "natural" Republican constituency, Muslim-Americans are increasingly leaning Democratic, and they are expected to vote in record numbers for Democratic candidate Hillary Clinton in the U.S. presidential election in November. From overwhelmingly voting for George W. Bush in the 2000 election to backing Clinton in the current cycle, the Muslim shift in political allegiance has been precipitous, leading some critics to lament a lost Republican opportunity to keep an increasingly influential voting bloc. According to surveys conducted after the election, more than 70 percent of Muslims voted for Bush, and most of the 50,000 Muslim votes in Florida went to the Republican candidate. Bush won the election after a prolonged recount of the vote in Florida, a state he won by a mere 537 votes, and a dispute that ultimately was decided by the U.S. Supreme Court, the country's highest judicial body. FILE - President Barack Obama meets with members of Muslim-American community at the Islamic Society of Baltimore, Feb. 3, 2016. To Muslim-Americans and many conservatives alike, Bush's victory was evidence not only of growing Muslim political weight but also of a "natural" affinity between Muslims and Republicans. Suhail Khan, a prominent Muslim-American Republican and former board member of the American Conservative Union, wrote that "Muslim-Americans are, by and large, both socially and economically conservative," and therefore a natural Republican constituency. Many Muslim-Americans do share conservative Republican values of supporting strong families and traditional marriage, and opposing abortion. And Khan noted that a quarter of U.S. Muslims are small-business owners who favor Republican policies on lower taxes. If there was a high-water mark in the love affair between Muslim-Americans and the Republican Party, it was the 2000 election. In 2004, more than 90 percent of Muslim-Americans voted for John Kerry; in 2008 and 2014, Muslims voted for Barack Obama, by 89 percent and 85 percent, respectively, according to several estimates. Why did so many Muslims desert the Republican Party after the 2000 election? The most common answer given by Muslim advocates is a resurgence in Islamophobia, and a U.S. foreign policy perceived as detrimental to Muslim interests around the world. While Bush sought to reassure Muslims after the attacks of Sept. 11, 2001, that the United States was not at war with Islam, Republican policies and rhetoric have since reinforced a perception among many Muslims that the party is a hotbed of Islamophobia. "Sadly, the Republican Party over the past 15 years has become the political epicenter of Islamophobia, introducing anti-Muslim policy proposals or anti-foreigner laws in at least 10 state legislatures," said Robert McCaw of the Council on American-Islamic Relations (CAIR). "This has really driven the Muslim vote out of the Republican Party." But Islamophobia and foreign policy alone don't explain the Muslim exodus toward the Democratic Party. A more compelling reason may lie in history. As Georgetown's Esposito explains, most Muslim-Americans, like other immigrants, have long identified with the Democratic Party's pro-immigration and social welfare policies; the Republican Party has appealed to only a small, mostly affluent segment of the community. The Muslim-American population, estimated at around 3.5 million, is a heterogeneous lot. While African-Americans, historically a Democratic constituency, make up about one-third of the community, most Muslims in America are immigrants, hailing from dozens of countries, many with conservative backgrounds. But among second- and third-generation Muslims coming of age in America, polls show their social attitudes have moderated in recent years. Many members of this rapidly growing community not only lean Democratic, but also embrace progressive views that are at odds with Republican orthodoxy. In the 2011 Pew survey, 70 percent of Muslims in America described themselves as Democrats or leaning Democratic, while 11 percent said they were Republicans or leaning Republican. Those numbers have held relatively steady since then. McCaw of CAIR cited another poll that showed 55 percent of Muslim-Americans describe themselves as moderate, while 26 percent identify as liberal. Many analysts thought conservative Muslims and Republicans shared common views on issues such as homosexuality and the role of government. The 2011 Pew survey showed that Muslim-Americans have grown "considerably more accepting of homosexuality" since 2007. On the role of government, the survey found that 68 percent of Muslim-Americans preferred a bigger government providing more services over a smaller government providing fewer services. "So not only do they switch parties and now are voting Democratic, but they're also adopting some of the policies and positions and ethics" of the Democratic Party, McCaw said. "Traditionally, a number of immigrants from the Middle East or South Asia are more socially conservative, and there was a place for them in the Republican Party. But I think as people grow and develop in America, [they] definitely change their views and preferences over time; and more importantly, their children grow up here and they might be voting different than their parents previously had." Esposito says that Republicans and Muslims were not really natural allies to begin with, and that culturally and politically most Muslims feel more at home in the Democratic Party. He points to polls showing that far more Republicans than Democrats hold a negative view of Islam and Muslims. The 2011 Pew Research Center found that that 15 percent of Muslims see the Republican Party as friendly toward their community, compared to 48 percent who see it as unfriendly. By contrast, 46 percent of Muslims found the Democratic Party friendly toward them, and only 7 percent said it was unfriendly. Sajid Tarar, a longtime Muslim-American activist now campaigning for Republican Donald Trump, disputes the notion that most Muslims feel at home in the Democratic Party. He says the party "hardly recognizes us as a minority." 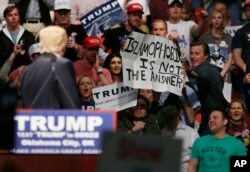 But surveys show that the Muslim-American flight from the Republican Party has only deepened amid anti-Muslim rhetoric by Republican candidates, most notably Trump, who enraged many Muslims by saying "Islam hates us" and proposing to ban all Muslims from entering the country, a position he has since softened. 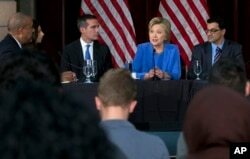 FILE - Democratic presidential candidate Hillary Clinton participates in a roundtable with Muslim community leaders at the University of Southern California in Los Angeles, March 24, 2016. Historically, Muslim voter turnout has been low in the U.S., but with surveys showing Islamophobia is a top issue, CAIR and other members of the U.S. Council of Muslim Organizations this year launched a "One America Campaign." They hope to register 1 million new voters, an increase of nearly 300,000 since the 2012 presidential election. Muslim turnout is expected to be high this year, Esposito says, with as much as 80 percent of the vote likely to go to Clinton. The Muslim-American vote remains relatively small, but with large Muslim communities in Florida, Ohio, Virginia, Michigan and Pennsylvania, Muslim activists say their vote is likely to prove critical in tipping tight races in key swing states. Meanwhile, both presidential campaigns say they see the Muslim-American vote as important. The Trump campaign, perhaps recognizing the tepid level of support the Republican candidate enjoys among Muslim voters, appears far less focused on the community. Tarar says his American Muslims for Trump has about 1,000 followers, and he remains hopeful the candidate will visit a mosque soon. "It is a very tight race and every vote counts," said Tarar, who traveled with Trump earlier in the campaign and later spoke at the Republican National Convention. "Right now, they're working on the African-American voters and issues." Clinton's campaign says the Democratic candidate has met with Muslim community leaders over the past year and the campaign is working to mobilize Muslim voters in several key swing states. "We're not taking any vote for granted," said Zara Rahim, a campaign spokeswoman on Muslim-American issues.